Published November 12, 2014 By Leisa Good This post may contain affiliate links. Regardless, I only recommend sites I've researched and/or used and trust. Do you long to work as a virtual assistant? Are you tired of spending your marketing dollars looking for private clients? Would you like to just have the leads found for you? Then Contemporary VA might be the right work at home job for you. What Exactly is Contemporary VA? 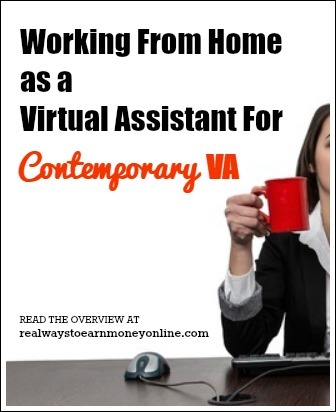 Contemporary VA is a work at home company that offers support from virtual assistants who are North American trained and able to perform. A guarantee of 99% accuracy on all work is given to the clients, who may purchase hours upfront or have a monthly retainer. The client may work directly with the VA on a monthly retainer or work directly with the project manager if there is a set amount of hours purchased. Contemporary VA is considered entry-level, but they do have a pretty intense screening process before you can be considered to work for them. After you've been screened, you have to do a skills test and some sample tasks. Once you are past the screening, skills test, and sample tasks, you become an apprentice for the company for 60 days. This means you're not actually working directly with clients — you are instead just helping out other, more seasoned virtual assistants for the company and getting some valuable training time in. This company is similar to Wordwide101, eaHelp, Time Etc. and many other places that hire virtual assistants — Contemporary VA connects virtual assistants to clients. So you don't have to go out looking for your own clients. What Are the Hours and Pay at Contemporary VA? The hours may be part-time or full-time (almost) and may be done on your schedule as long as the client’s agreed-upon requirements are met. The pay is $10.00 an hour. You must be available to commit to at least 4 hours a day from 9 a.m. to 5 p.m., Monday through Friday. It appears that pay every other week via check in the mail. One thing to keep in mind here before you apply is that you must sign an exclusivity agreement with this company. This means you cannot have other clients that you don't get through Contemporary VA. This would NOT be appealing to someone who is trying to launch their own VA business on the side for extra income, but for others who aren't interested in going that route, it shouldn't be a big deal. What Are the Computer Requirements at Contemporary VA? The computer requirements are fairly standard at Contemporary VA. As long as you have an updated laptop or PC with updated virus and malware protection you are should be fine. PCs and Macs are both welcome, and they do allow some work to be done via iPhone or iPad. What Types of Work Will You Be Doing as a Virtual Assistant for Contemporary VA? be able to communicate verbally and in writing. have a desire to learn and grow their skill sets. be organized and able to work independently. servicing teammates requests with over flow. Does Contemporary VA Hire Virtual Assistants From Other Countries? Contemporary VA hires all over the world. However, eligible applicants must be fluent in English both written and verbal. Are You an Independent Contractor or an Employee at Contemporary VA? At Contemporary VA you are an independent contractor. If you stay with the company for over two years, you may be able to become an employee, if your state allows. What Do Workers Think of Contemporary VA? After some research on Glassdoor, it appears that on the positive side, people say it's a fantastic opportunity for people new to virtual assisting because they train you on lots of different software and overall just teach you a lot. So you can take your experience here and use it to get better paying VA work down the road. Many of the workers also enjoy the flexibility and being done during business hours. Regarding negatives, some have said it's stressful work and those in charge put you through a lot of pressure and micro-management. It's also been mentioned that there are no benefits, but this pretty much comes with the territory when you are doing any sort of independent contractor work. How Can an Interested Applicant Apply to Contemporary VA? Go to this page and get started with the application. Be prepared to upload a resume. Should Contemporary VA be interested in you, you will be invited to an interview. Google the company name and reviews and you will find a bunch of negative reviews. Just reading them on Glassdoor was enough for me to say no. Stay away. I was a client of this company and the way they treat their contractors/VA’s and their clients is appalling. I experienced them to have a bullying style of doing business. I wish I had read these reviews before hiring them. I’ll write more later. You will be shocked to hear how they have treated us. I strongly recommend you read all of the reviews on this company before considering working for them or hiring them. Protect yourself and your company. @Jane – No problem. Thanks for sharing. It always amazes me how two people can have totally different experiences at the same company. I try to be as objective as I can when writing company reviews. However, it is not an exact science as so to speak. It is good when everyone comments and shares to give the different experiences. So again, thanks for sharing. I wish I had read the comments too, because CVA wasted a lot of my time for FREE training ( that’s the way they “advertise” their cheap ways.) I don’t really understand how they can decide to NOT PAY an INDEPENDENT CONTRACTOR but expect them to be available for FREE from 9-6 pm EVERY DAY. I respectfully disagree with the review, though I love this site and your work. I’ve been employed by CVA for 2.5 years. I started as a PVA and advanced to a leadership position throughout my time with CVA. I’ve found the mentoring, training and guidance provided by other VAs and the management team to be exactly what I needed to become a valuable asset to many different types of clients who greatly benefit from CVA’s services. If you are interested in actually investing time and energy into bettering your own skills so you CAN advance and learn and grow as a VA, then CVA is definitely the place to be because they will guide you to being better in every avenue possible! I so wish that I read all of these reviews BEFORE I even applied. These reviews are all true. If you would like to read about my horrible three days with this company, read on. I was hired by Contemporary VA (CVA). I was told that training, two weeks of it,was unpaid, that was okay with me. The training was very intensive but rather pointless. Then there are the mandatory meetings, (the one I attended was a total waste of time) again unpaid, every Wednesday am. And if you are asked to do a project where you need to learn something new, you need to learn what ever you need to know but learn if fast because your learning time is not paid. So I gathered that you are being forced to spend much time learning and very little time actually earning. My brain is filled! Honestly, this is going slower than I expected. So much to learn…. Eager to finish PVA training so that I can start to do something where I get paid. I only intend to work about 20-25 hours per day so that is why I am not further along in my training. I am in my office from 9AM to 1 PM M-F and intend to work also on the training after hours until it is finished. Thank you for asking. It is quite time consuming and there is a lot to learn. I remember working 10-12 hour days trying to finish up the pva training course and taking on tasks. You are able to take on tasks before your pva training course is finished though. Is there a reason you only intend to work about 20 to 25 hours per week? I also try to work part time hours but that doesn’t always work out for me. Then, I found out that the quizzes that I took, were wrong and they wanted me to redo them. However I was not given any explanation why my answers were wrong. I was over the edge when I realized that thy expected me to be on the job 10 -12 hours! The wrong quiz answers with no clue as to why they were so totally unacceptable made me realize that this company was something I needed to run from fast. I DID NOT LIKE WORKING FOR THIS COMPANY. So, when you’re first hired, you’re a “project virtual assistant.” This means that you help the Dedicated Virtual’s assistant, assistants. You have a month to get to an assistant. To get to be an assistant (NOT a DVA, who is top tier), you have to have done certain tasks/projects. HOWEVER, it is up to the DVA to assign 10% of their work amongst about 6 other people on the team. You have to sit and watch your computer for HOURS until MAYBE somebody posts something saying they need help. You have to be the first one on it, and if you’re a second too late, you wont get to help on the project. The last 2 weeks of the month there is barely any work. Its very hard to move up, and even harder to get any work, since you are at the mercy of the team leader saying- hey I need help. Its a very unfair system, and I found it a total waste of my time. Oh, and they fire at will, for any reason. I just wanted to share my experience with the application process. I applied at Contemporary VA earlier this week and was invited to a virtual interview a day or so later. The interview consisted of typical interview questions that you then typed the answers in paragraph style, as well as a few multiple choice questions. I was then contacted again the next day stating that I have made it to the next stage, which is to give me more information on their policies. They mentioned that since I’m a freelance graphic designer, due to their non-compete clause, they would not be able to hire me unless I agreed to cease my freelance graphic and web design work. I was hoping to use this as extra income, as my freelance business is often slow, but I do have current clients and projects that I would not want to break ties with, so I had to decline. I did ask them if I could be contracted to do clerical work only, but they said that this would not be possible. So just a heads up, that if you’re currently a freelancer doing any of the services that they offer, or if you work as a VA elsewhere, you won’t be able to work for them. Unless you choose to not tell them about your other work.